radishes and their greensprovide an excellent source ofvitamin C. Radish leaves containalmost six times the vitamin Ccontent of their root and are alsoa good source of calcium. RedGlobes also offer a very goodsource of the trace mineralmolybdenum and are a goodsource of potassium and folicacid. Daikons provide a verygood source of potassium andcopper. Like other member ofthe cruciferous family (cabbage,kale, broccoli, Brussels sprouts), contain cancer-protective properties. 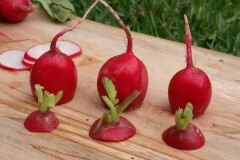 Throughouthistory radishes have been effective when used as a medicinal food for liverdisorders.